We’re thrilled to offer you our first Bike and Barge tour — this time to one of our most favorite places in the world — Italy. 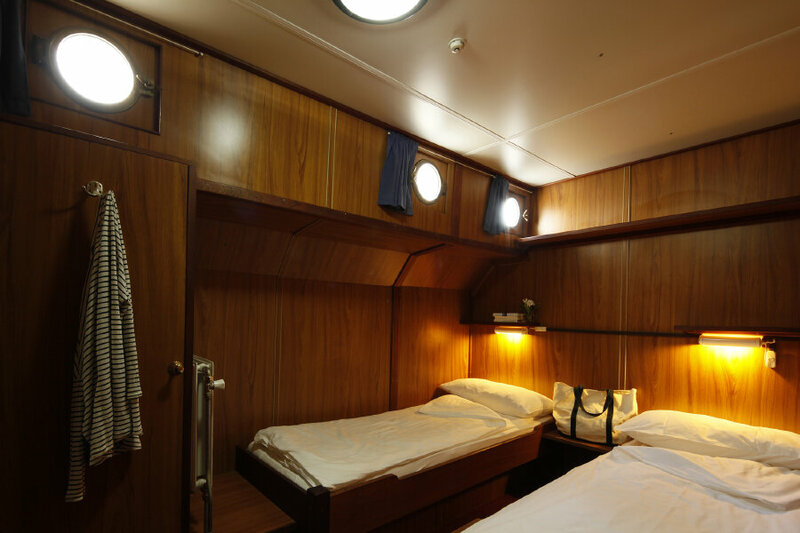 Bike all day, dine all evening and sleep in our own private barge at night. 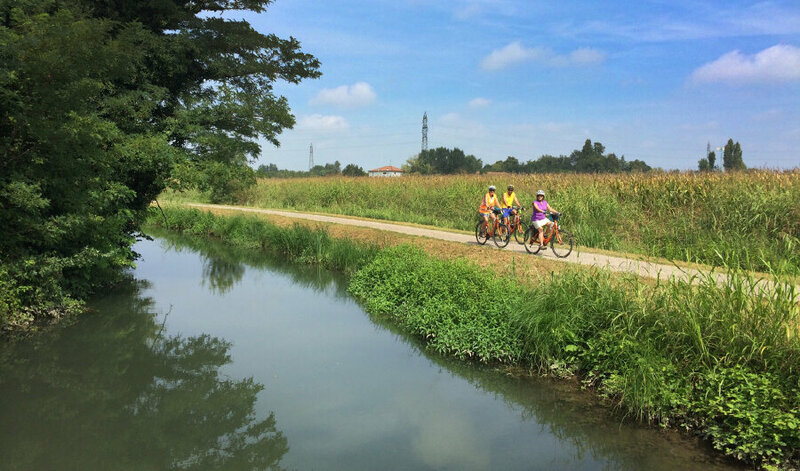 The cycling is flat and the scenery is stunning as we travel from one of the most beautiful cities in the world — Venice — to Mantua, Italy. Flat terrain on paved bike paths and some roads along rivers and canals. Leisurely cycling level. 7 nights lodging, 7 breakfasts, 6 sack lunches, 7 dinners, cue sheets and maps, rental bicycle, shuttle from Adria to Zelo, guided walking tours in Mantua and Venice, and trained bilingual guides. Step-thru hybrid bike included. Electric-assist bike available for $195. 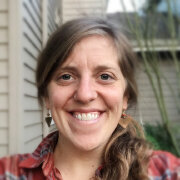 "Our meals were better than anything I could possibly have expected. 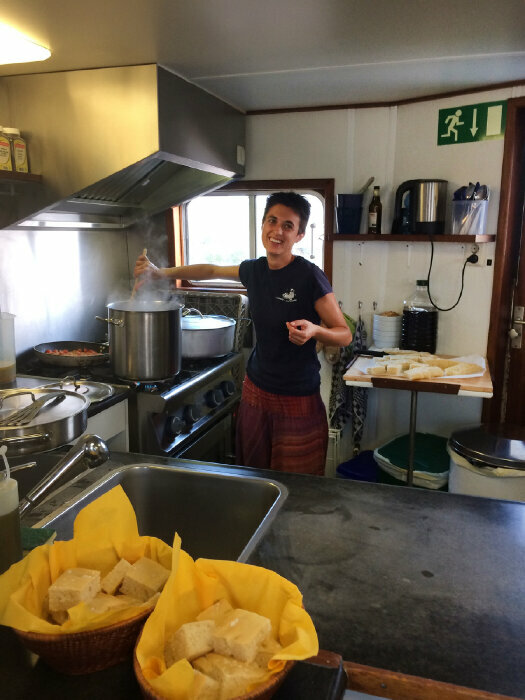 We remained in Italy for two more weeks and the barge food stood out as some of the best on the trip!" 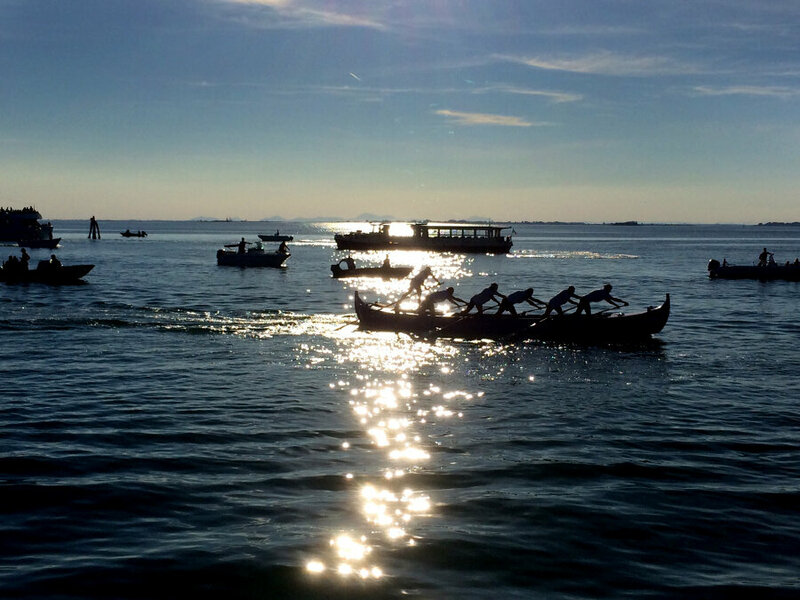 DAY 1: We meet at 6:30pm onboard our boat, the Vita Pugna, docked in the Venetian lagoon. Our home away from home holds 20 guests. 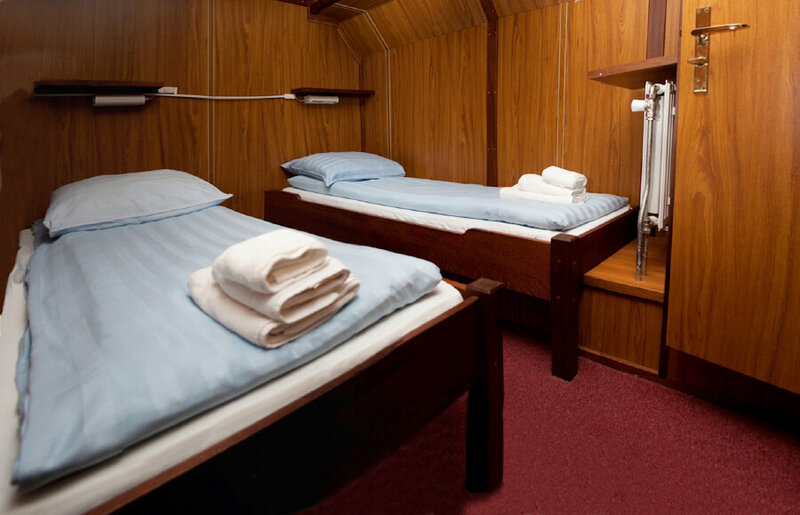 Each room has two beds and its own bathroom. After introductions to the crew and an orientation, we’ll enjoy our first dinner together on the barge. 0 miles. 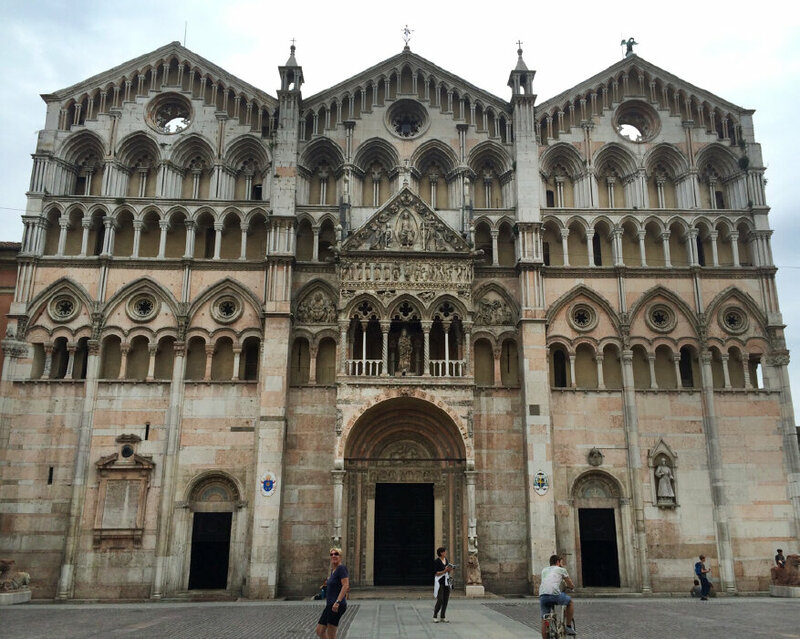 DAY 2: In the morning, a local guide will help us discover Venice on a walking tour. 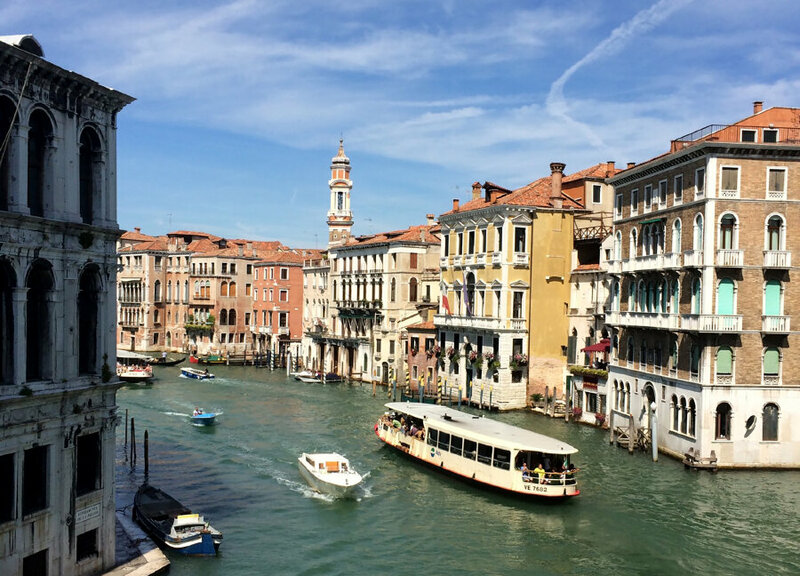 It was once the capital of the ancient Serenissima Republic of Venice and ruled over much of the Mediterranean. Today it’s one of the most romantic cities in the world, and an easy one to get lost in. 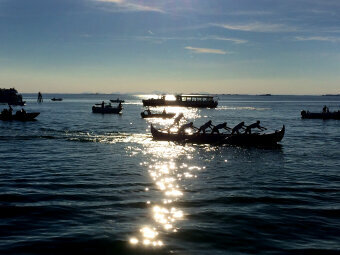 You can spend the afternoon exploring this unique place on your own before returning to the barge for dinner together. 0 miles. DAY 3: After our bike fitting, we will cruise out of Venice together and start island hopping using our bikes and the barge. 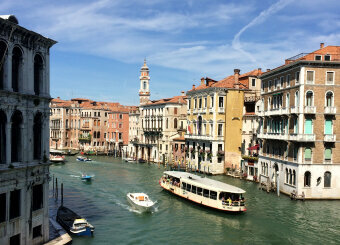 Our first stop is Lido, home of the Venice Film Festival, mansions and luxury hotels. Then it’s on to Pellestrina and the Ca’ Roman nature reserve. The island’s bike path will take us past beautiful beaches and sand dunes. 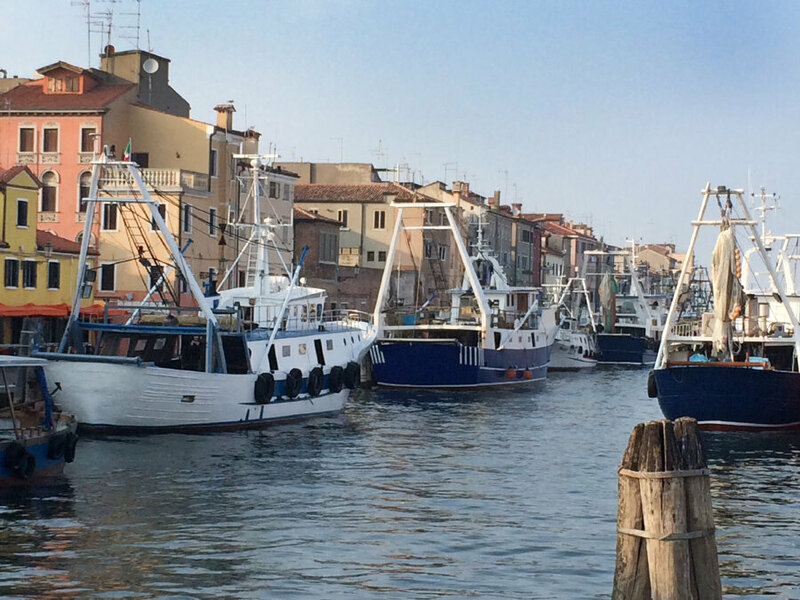 We will finish our cruise down the Adige River to the bustling fishing town of Chioggia. Situated on the coast just south of Venice, it also has small canals, stone-arched bridges and narrow alleyways, earning it the title of “Little Venice.” 18 miles. 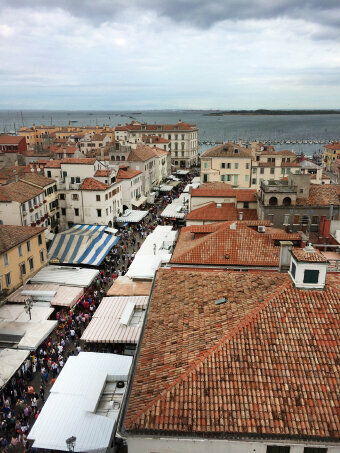 DAY 4: We'll start our day with a visit to the famous Chioggia fish market. 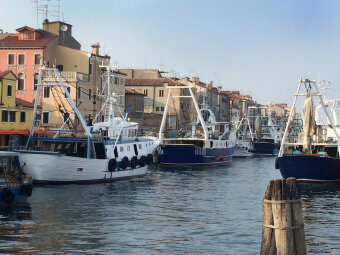 Countless stalls of fishmongers sell locally caught fish delivered from boats at 4am, as well as seafood from elsewhere in Europe. You won’t forget the sights, sounds or smells of this lively institution. Then we hop on our bicycles to explore the Po Delta, a UNESCO World Heritage Site. The Po Delta is a protected area and one of the most biodiverse in Europe. Keep your eyes peeled for some of the 300 species of birds here, such as ibis, grebes, herons, and pink flamingoes. We’ll overnight in the town of Adria, which was once connected to the Adriatic Sea and an ancient Greek port. A local museum highlights the town’s Etruscan, Roman and Venetian heritage. 25 miles. 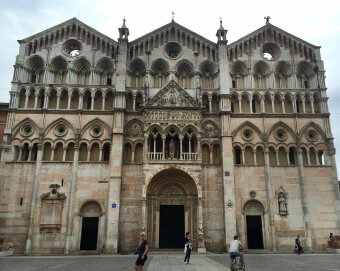 DAY 5: After a short cruise in the morning, we’ll start cycling along the river to Ferrara, the bicycling capital of Italy. Bikes are everywhere. The town is also a UNESCO World Heritage Site and still has 500-year-old walls surrounding it, which have been transformed into a beautiful linear park. You can’t miss the 14th century moated medieval castle in the very center of town. Then we’ll shuttle to our overnight in Zelo on the Canale Bianco. 22 miles. DAY 6: We’ll begin our day with a short cruise and then a bike ride to the town of Bergantino and the National Museum of Carousels and Entertainment. Its fascinating collection not only documents the history of amusement parks but also explores the human need for escape and entertainment. 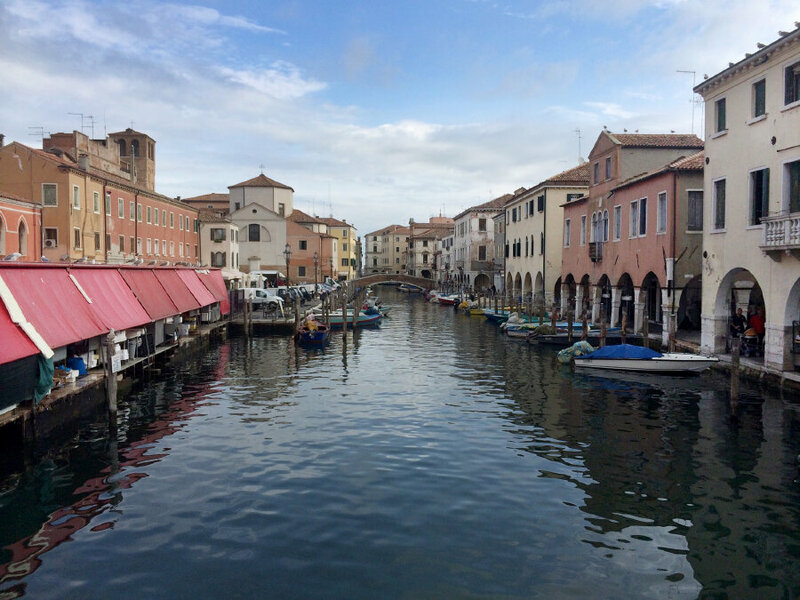 After a cheese tasting of the local Grana Padano, we’ll follow the Po River through the charming small riverside towns of Ostiglia and Libiola. 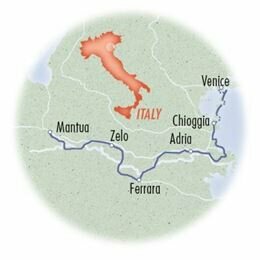 The Po is the longest river in Italy and winds its way from its source in the Alps to the Adriatic Sea. 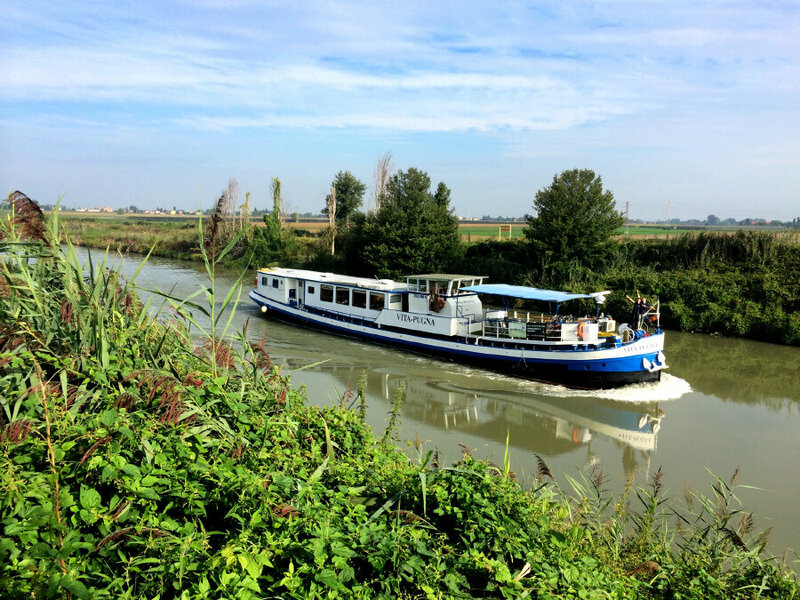 Once in Governolo, we’ll follow the Mincio River until we reach Mantua and the finish of our cycling. 32 miles. 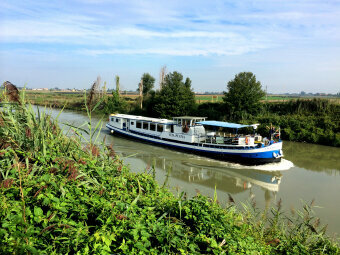 DAY 7: We’ll spend the day discovering the gem that is Mantua, first on our bikes and then with a guided walking tour. Once a city-state ruled by the Gonzaga family, its center-city was declared a UNESCO World Heritage Site for its beautiful Renaissance architecture. We’ll explore the narrow alleys and lanes that wind through the lively town center. We’ll also explore the three man-made lakes built centuries ago that surround the city like a moat. We’ll return to our barge for our last dinner together. 24 miles. DAY 8: We say our good-byes after breakfast this morning. You are free to travel the short distance to the Mantua train station for your return home. Ciao! 0 miles.